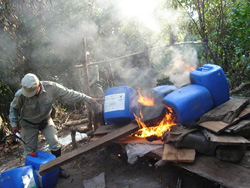 In June 2008, the Cambodian government set up a media show, burning 1,278 drums of safrole-rich oil—a key ingredient in the manufacture of the illicit recreational drug ecstasy—with the help of the Australian Federal Police (AFP). The amount of oil could have been used to make an estimated 245 million ecstasy tablets with a street value of $7.6 billion in Australia, the AFP claimed. While thick black plumes of smoke went into the air, Australian police officers, who had traveled to Cambodia to assist in the public burning, looked on wearing chemical suits and breathing apparatus. Many people believe that ecstasy is merely a synthetic drug that is manufactured solely with chemicals, so-called precursors. However, the main raw material for ecstasy, safrole, is extracted from various plants and trees in the form of safrole-rich oils—also known as sassafras oil. These oils may contain safrole levels of more than 80 percent or 90 percent. They are usually first converted into chemical precursors before being diverted from the legal trade to clandestine ecstasy labs. Safrole and its derivatives have many legal uses as well. It is marketed worldwide in large quantities as raw materials for the fragrance and pesticide industries. The main production area is Southeast Asia and China. Burma is a significant producer of safrole-rich oils, locally known as thitkado. The word literally means “fragrant tree” or “good smelling tree” (thit means wood or tree, and kado means fragrant). Thitkado is also locally used as a traditional medicine—applied externally against skin diseases and rashes and for inhaling. Precursor control is the “second front” of international drug control. It became part of the international drug control agenda in 1988 with the adoption of the Convention against the Illicit Traffic in Narcotic Drugs and Psychotropic Substances. To prevent the diversion of precursors and essential chemicals from licit channels to illicit drug manufacture through an import-export pre-notification system, the International Narcotics Control Board (INCB) has developed special guidelines. Safrole and safrole-rich oils are both scheduled on the Red list of the INCB and are subjected to controls. As the demand and supply of drugs still cannot be controlled, preventing the diversion of precursors to produce them has become one way to reduce the supply. However, precursor control suffers from the same setbacks as the fight against drugs in general: despite increasing control mechanisms, the market is not really affected. The public burning in Cambodia was staged with the help of the United Nations Office on Drugs and Crime (UNODC), which has been sounding the alarm bell on the illicit trade in safrole-rich oils for some years already. Conservation organizations such as Fauna and Flora International (FFI), Wildlife Alliance and Conservation International have joined the fight as well. According to David Bradfield of the Wildlife Sanctuaries Project of FFI, safrole production in the Cardamom Mountains in Cambodia is wreaking ecological damage. 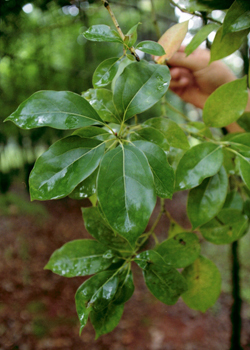 “The production of sassafras oil over the last 10 years has severely depleted the trees and if the illicit production isn't stamped out soon, they could become extinct in the near future,” he warned. The livelihoods of 12,000 to 15,000 people in the wildlife sanctuary are at risk. Cambodian authorities dismantled more than 50 clandestine laboratories and arrested 60 to 100 people involved in safrole production in the past few years.